Salon des femmes got together for a one night show in association with OUSA Art Week. 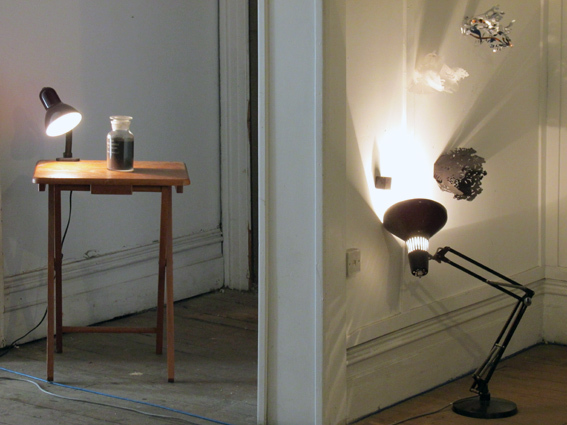 The exhibition theme was a response to the word ‘compact’ and was held in a small entry foyer leading to art studio spaces on 140 George St.
condensation Psychology The process by which a single symbol or word is associated with the emotional content of several, not necessarily related ideas, feelings, memories, or impulses, especially as expressed in dreams. 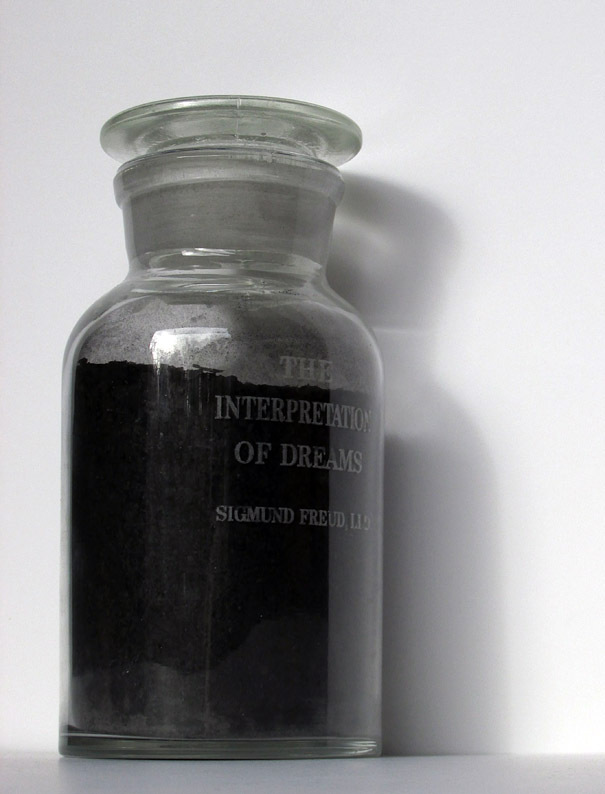 The reagent bottle containing the charcoal remains of Sigmund Freud’s book The Interpretation of Dreams, symbolises suppressed hopes and dreams. Check out Salon des femmes for more images. 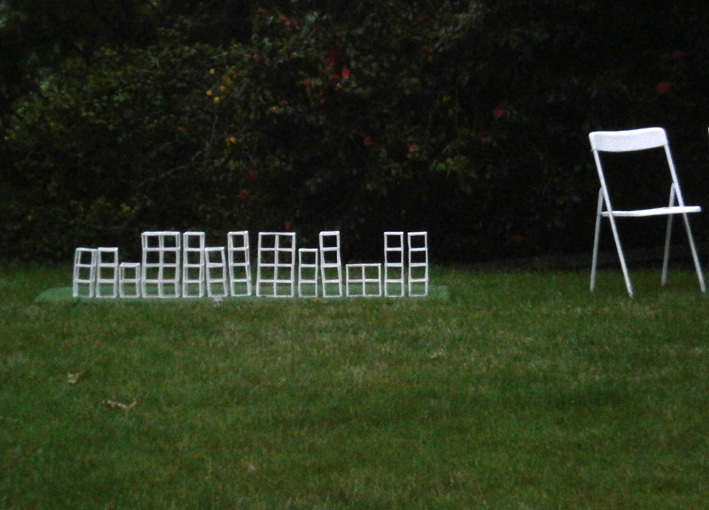 This entry was posted in 2014 and tagged Collaboration, Exhibition, Sculpture on October 9, 2014 by marionwassenaar. Carbon Boots, charcoal, 19 x 24 x 32 cm each pair x 7. Situated on the historic Louden homestead verandah. 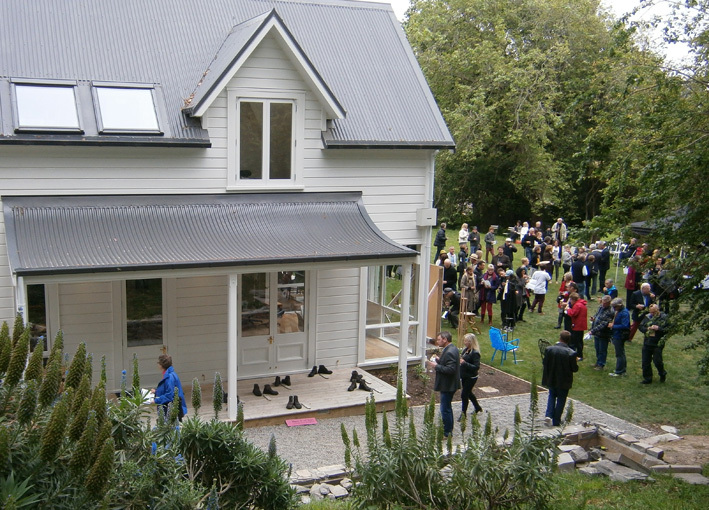 Sculpture on the Peninsula is a biennial event that takes place at the historic Louden Farm, Teddington on Christchurch’s Banks Peninsula. The event is a weekend fundraiser for Cholmondeley in Governor’s Bay and is hosted by the Lombardy Charitable Trust. 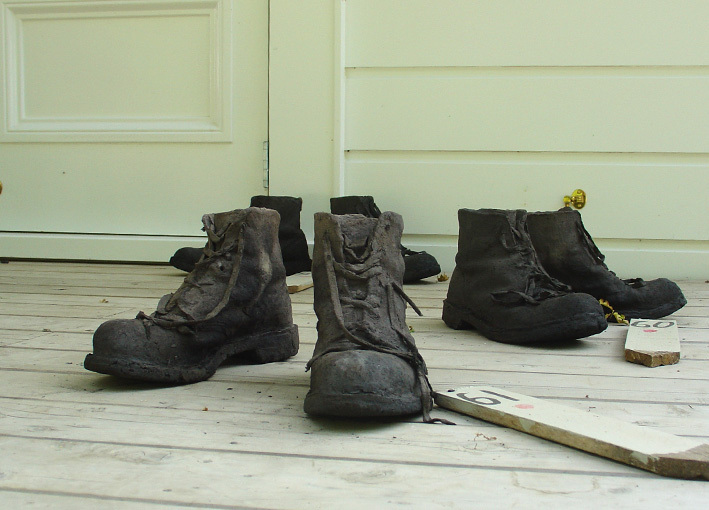 Work boots are regarded as possessing a tough, reliable durability, offering comfort and trusted protection. They are synonymous with the physical production associated with the manual labourer working on the land or employed in industry. Increasingly, however, work boots represent the human contact with the earth in the rescue and rehabilitation of environmental damage. Through concerns that our living world is in crisis, the fragile Carbon boots are created from recycled newspaper and transformed into charcoal works that retain the carbon content in the newspaper. The ephemerality of charcoal communicates the impermanence of life and the reality of human existence in a consumerist world. Also among the fifty-five artists taking part in the event were friends, Jane Armour and Liz Rowe whose works feature below. 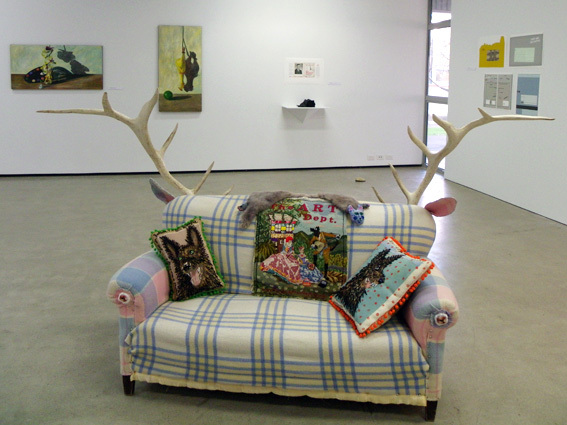 This entry was posted in 2013 and tagged Exhibition, Sculpture on April 26, 2014 by marionwassenaar. Following four highly successful symposia held at the Dunedin School of Art – ‘Illustrating the Unseeable: Reconnecting Art and Science’ (2009), ‘Art and Law’ (2010) ‘Art and Medicine’ (2011), and ‘Art and Food’ (2012) – the Dunedin School of Art and Brandbach organised a further Symposium, ‘Art and Money’, in August 2013. 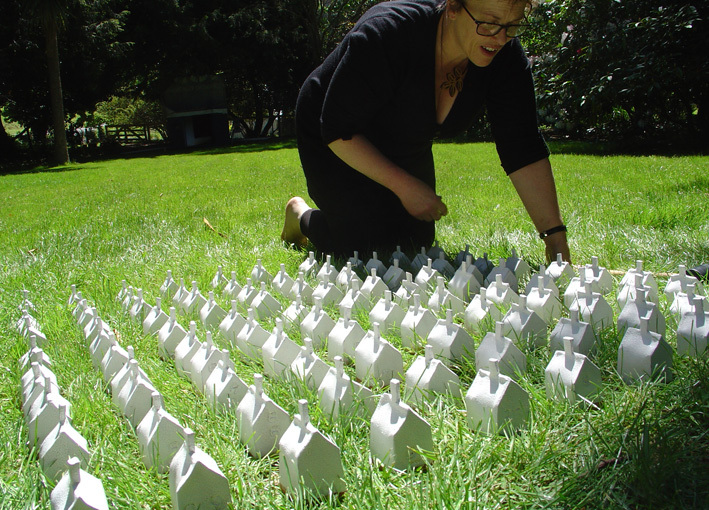 The symposium included an exhibition at the Dunedin School of Art gallery. 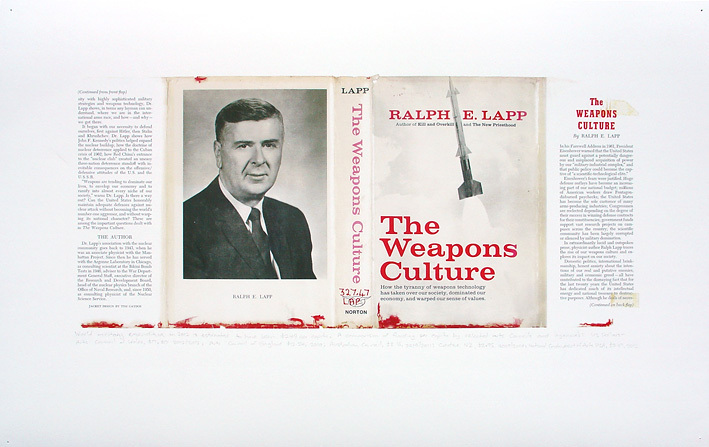 Withdrawn includes a digital reproduction taken from the original dust jacket of a retired library book. 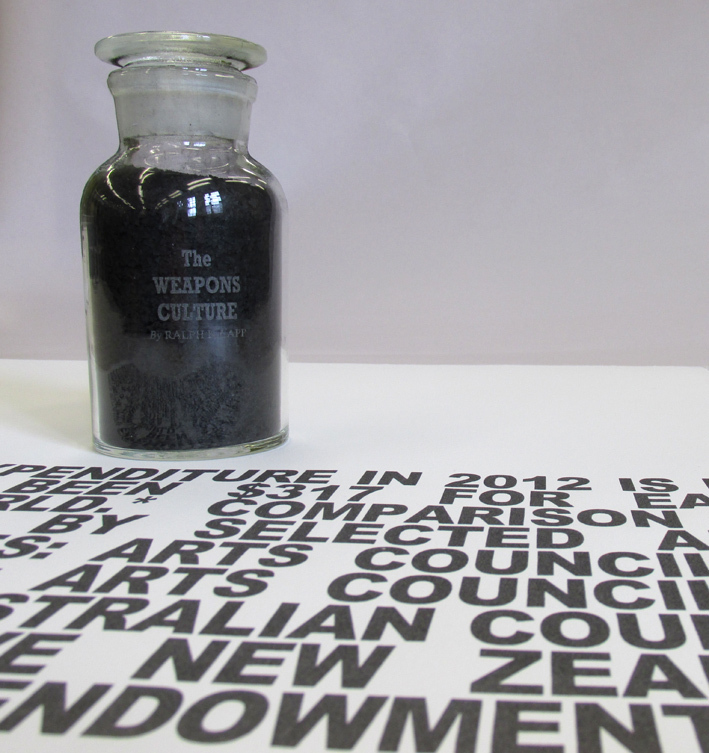 The hand written text below the image shows a summary of expenditure per capita that reveals the contrast between military expenditure and arts funding. On a shelf, directly beneath the image, sits the the library book reduced to a carbon shell. This entry was posted in 2013 and tagged Exhibition, Print, Sculpture on March 29, 2014 by marionwassenaar. 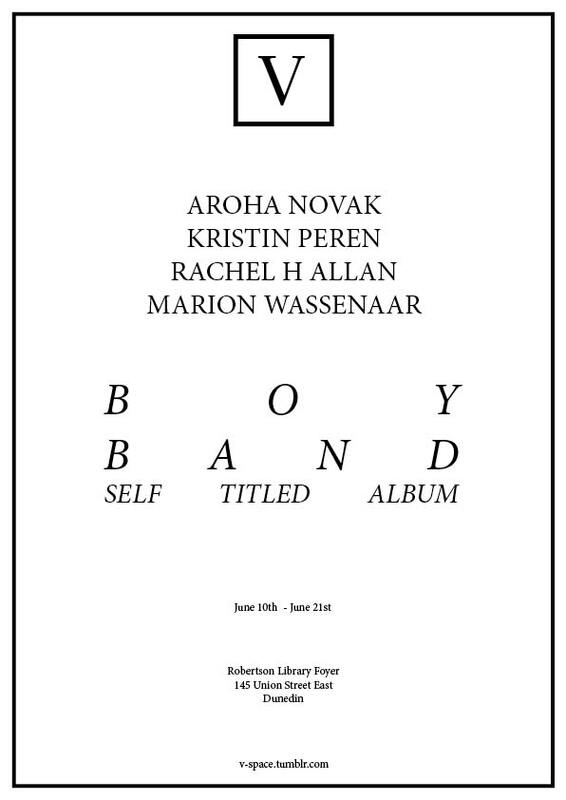 BOY BAND – Self Titled Album is situated within the diminutive V-Space, in Otago University’s Robertson Library that, for me, expands on Marcel Duchamp’s Boîte-en-valise (Box in a Valise). 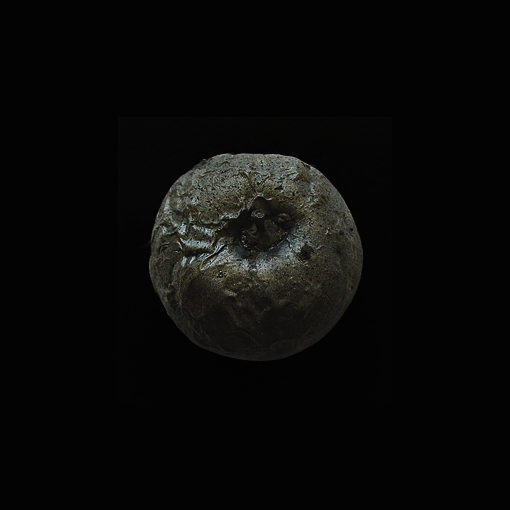 Working with found objects, each artist has in some way responded to the use of a suitcase that suggests that their research is not terminated at the end of their programme but has the capacity to venture into further fields of discovery. News of the World is a response to the News International phone hacking controversy that exposed corruption and bribery in the British press and the consequent closure of the ‘News of the World’ publication after 168 years in print. 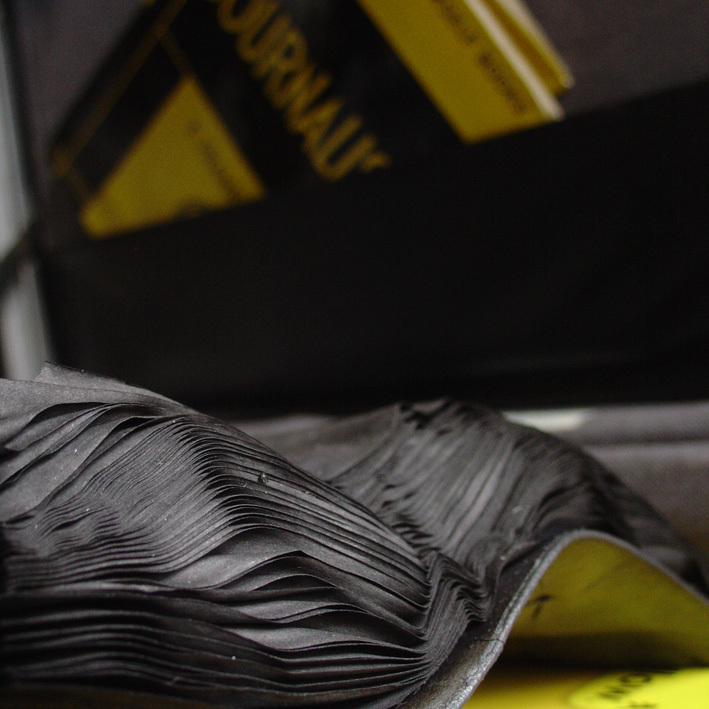 Carbon and the dust jacket are all that remains of the book titled ‘Journalism’. 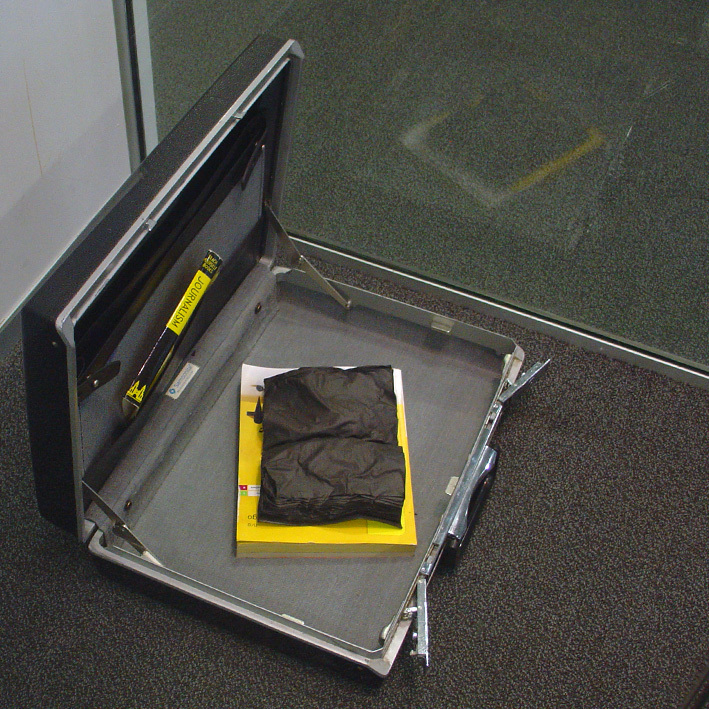 The carbonised book rests on the Yellow Pages which mirrors the colours of the dustjacket slipped into the pocket of the briefcase. White collar, professional journalism is in the business of investigating and reporting and of holding others to account – The News of the World failed when it came to itself. This entry was posted in 2013 and tagged Collaboration, Exhibition, Sculpture on March 24, 2014 by marionwassenaar. 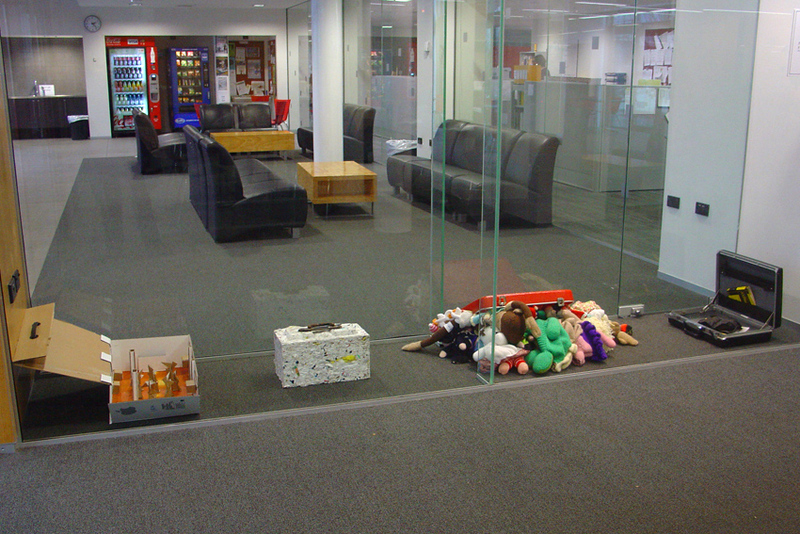 A photographic image from Carbon Black was exhibited in Open Doors. Portas Abertas (Open Doors) is an international participatory artistic project organized by Fórum Eugénio de Almeida on the occasion of its opening in the former Palácio da Inquisição (Palace of the Inquisition), marking the start of the cultural and artistic activities to be presented in this new space in Évora, Portugal. 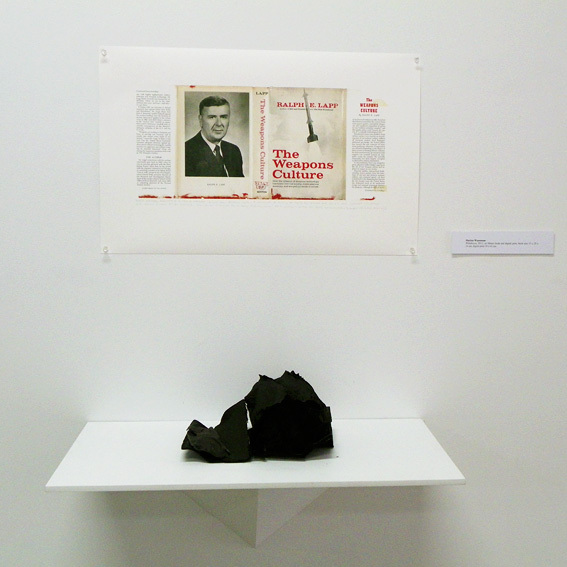 This entry was posted in 2013 and tagged Exhibition, Print, Sculpture on March 23, 2014 by marionwassenaar.